Taxonomy: Kingdom - Plantae (plants). Subkingdom - Tracheobionta (vascular plants). Superdivision - Spermatophyta (seed plants). Division - Magnoliophyta (flowering plants). Class - Magnoliopsida (dicotyledons). Subclass - Rosidae. Order - Sapindales. Family - Sapindaceae (maple). Genus - Acer L. Species - Acer circinatum Pursh. Ecology: Vine maple is typically an understory shrub found in both seral and climax Douglas-fir (Pseudotsuga menziesii), western hemlock (Tsuga heterophylla), western redcedar (Thuja plicata), Port Orford-cedar (Chamaecyparis lawsoniana), Sitka spruce (Picea sitchensis), and Pacific silver fir (Abies amabilis) forests on the west side of the Cascades. On the east side of the Cascades, vine maple occurs on moist bottoms in ponderosa pine (Pinus ponderosa) forests. 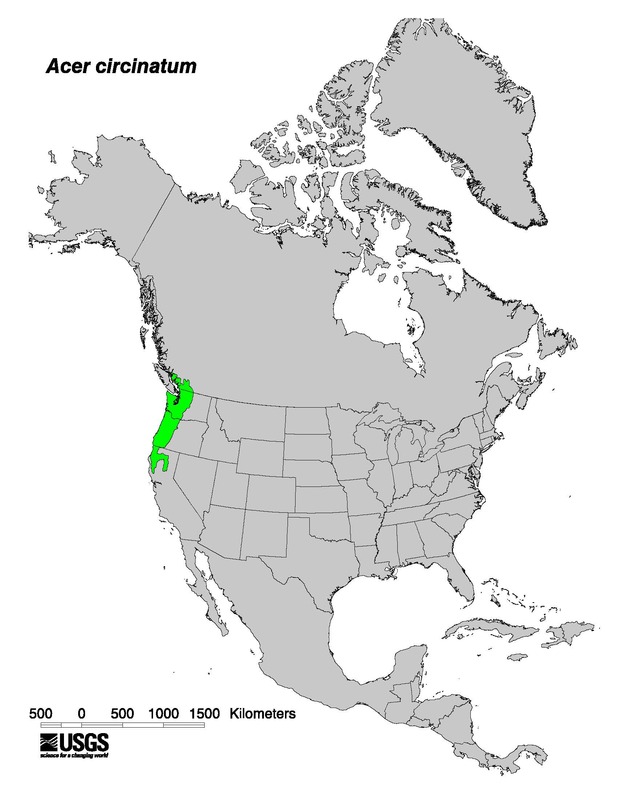 The western hemlock/vine maple/western swordfern (Polystichum munitum) plant association is common throughout the Olympic, Cascade, and Coast Ranges of Oregon and Washington. Vine maple sometimes dominates or codominates talus slopes with Sitka alder (Alnus viridis ssp. sinuata). It is also common along streambanks and alluvial terraces, in forest openings and clearcuts, and on talus slopes and the lower portions of open slopes. Vine maple is found in both seral and climax stages of forest succession, but cover and frequency are highest in early seral stages. Vine maple is a long-lived, shade-tolerant, deciduous shrub or small tree which shows a high degree of variation in growth form. The bark of vine maple is thin, smooth, and bright reddish brown. The leaves are round to cordate, palmately seven- to nine-lobed, serrate, and 3-6 cm long. Under favorable conditions plants in these open habitats occasionally grow up to 9.1 m tall with 20-30 cm trunks. Plants shaded by a coniferous overstory, however, commonly have prostrate stems that root where a stem touches the ground. In the WFDP: Vine maple is subject to herbivory in the WFDP; elk, in particular, may browse vine maple to a fatal extent. Another key factor affecting mortality of vine maple in this energy-limited system is suppression. Pathogens affecting vine maple in the WFDP include: black spot canker (unknown taxa) and Armillaria root rot (aka Honey fungus; Armillaria spp.). Fire effects: Most fires top-kill vine maple; however, plants normally resprout from the root crown. Following aerial crown kill or destruction by fire, root crowns often produce numerous sprouts. Its sprouting ability allows it to become part of the immediate postfire community when the conifer overstory is removed or killed. Seed production and dispersal - Vine maple begins to produce seed at an early age. The flowers appear in the spring when the leaves are about half grown. Flowers occur in loose drooping clusters that hang from the end of the branchlets. Male and female organs occur in the same flower; however, in each flower only male or female organs are functional. Thus only a few flowers from each cluster develop into fruit. The fruit consists of two fused samaras which eventually separate on shedding. Each samara contains a single seed without endosperm. Small quantities of seed are produced annually. Seed viability and germination - Vine maple seeds have a dormant embryo which requires approximately 6 months of chilling to germinate. Under natural conditions the seeds are dispersed in the fall and germinate in the spring. Studies have shown that vine maple seedlings are rare or absent from both clearcuts and mature stands. Vegetative Regeneration - Vine maple is a very poor seed producer and relies primarily on vegetative means of reproduction. Plants sprout from the root crown following top-kill from logging or burning. In early seral stands, layering occurs infrequently, but as plants mature some stems become too long and massive to remain erect and thus lay prostrate and root where the stem touches the ground. Burke Museum. 2016. Acer circinatum [Online]. University of Washington.